Helping Hands, When Everything Changes — Interfaith Housing & Community Services, Inc.
A student at Butler Community College since 2011, Candice was finishing her education to become a third generation nurse. She had waited until her kids were grown and started college later in life. In the fall she hit her head, causing a degenerative spinal cord injury and a cognitive disorder. Then, while being treated for her injuries, she reacted badly to a medication she was prescribed and had a stroke. "I lost 30 points off my IQ," she told me. Her injuries forced her to go on disability and she found herself on a very limited income. When Candice came to us, she was renting an old farm house in Buhler. She was hesitant to say anything bad about her previous situation, but eventually said the wiring was bad. "You could hear a zap when you flipped the switch in the kitchen." There was a hole in the AC unit that had been fixed with duct tape and the utilities were just too high on her limited income. She qualified for HUD assistance, but was sure her current home would not pass the required inspection. Candice talked to Clint Nelson, our director of housing development, and got on our rental waiting list. Clint and Candice worked with Diana at Hutchinson Housing Authority to investigate her options. It took nine months of looking for the right home when finally everything fell in line. "There was definitely divine intervention," she said with a smile. Candice's warmth lights up a room and her pride and care in her home is brightening up the neighborhood. As you drive by, you can't help but notice the beautiful flowerbeds and hanging plants. She even took the time to re-stain her deck, which has had a ripple effect on other homes in the neighborhood. 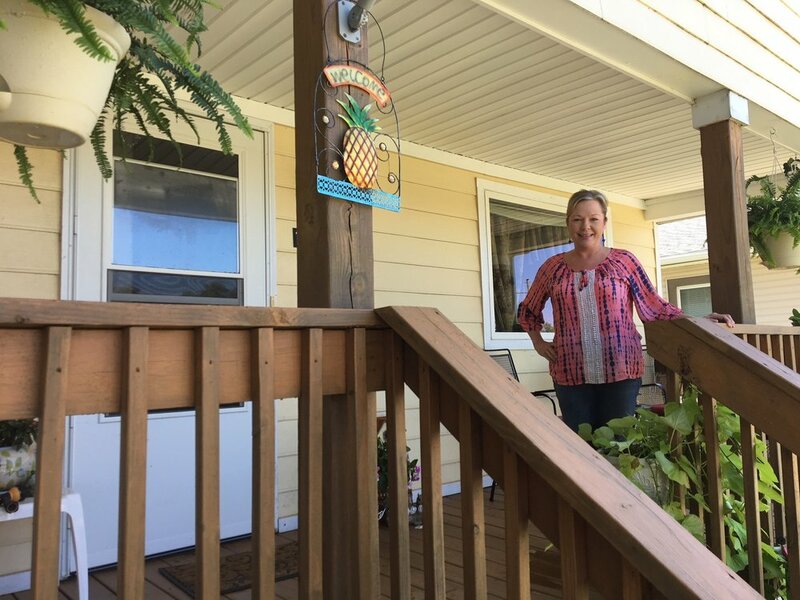 "Her house just makes me smile every day when I pass it," said Lorna Moore, CEO. Candice uses gardening as a way to keep busy and stay positive. She went aback to work part time, but just got word last week that the added strain of working again has caused further deterioration to her health. "It has been a hard couple weeks. Gardening i a good distraction from all of the reminders that I am not the same person I was. I can't do all the same things," she said, fighting tears. When asked about the difference Interfaith has made in her life, she did not hesitate. "Interfaith got me into a nice comfortable home that I can afford. If it weren't for Clint and Diana, I wouldn't be able to even live on my own." Candice often brings cookies to those of us in the office, just to be neighborly. When I told her how it makes us all smile to see her take such care of her home, particularly as a rental, she seemed surprised that wasn't the norm. "Why wouldn't I take pride in my home? It's my home. My 'humble abode.' I'm not going anywhere."